I've taken pictures of stuff. I haven't written about anything! I hope your having a great spring. We've had a few days of spring here. Actually, we've had many days of spring. But days of spring here a probably a little different than what you think of when you think of spring. My spring is 1/3 rain, 1/3 sunshine, and 1/3 60 degree days and 40 degree nights. Those nights make for great sleeping. Well, they are open for interpretation. Earlier this "spring" I came across this wreath. I don't remember how. 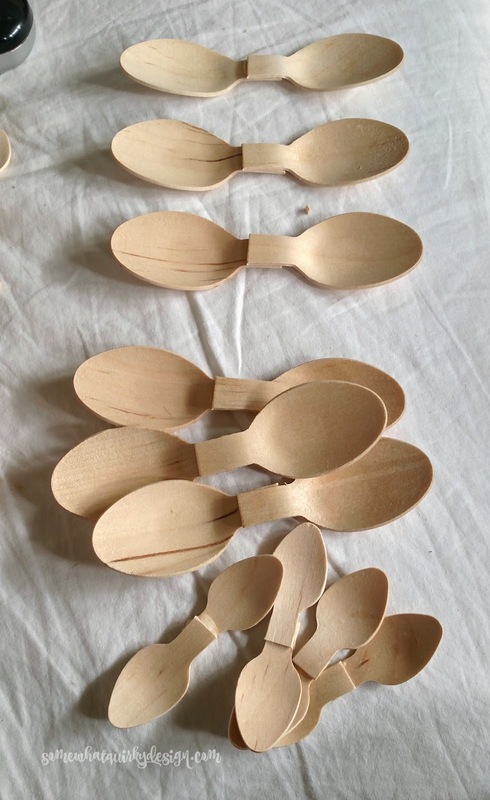 But it impressed me enough that I went straight to Amazon and bought the spoons I needed to make something like it. Seems like I knew that I would use more flowers so I ordered some extra. For many, many, springs. 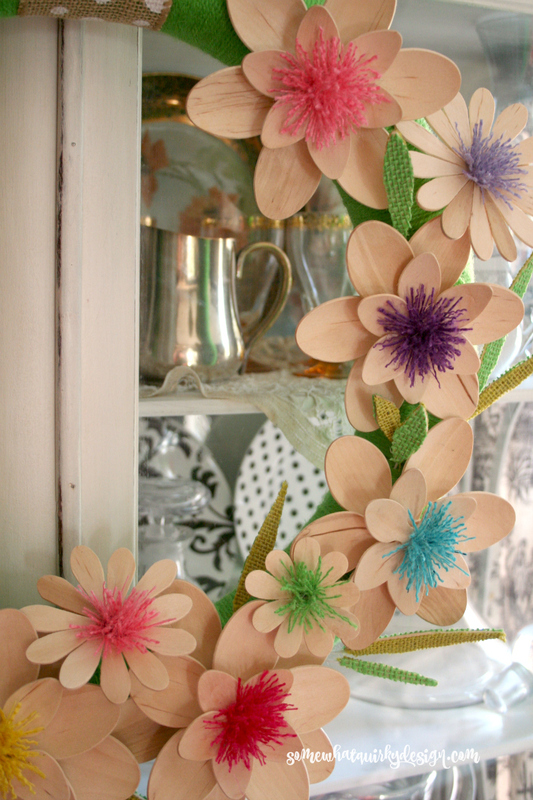 For many, many years, I have been wanting to do a paper flower wreath for spring. I wanted one along these lines (here and here) except brighter and more colors. But I didn't want to fold all the flowers! Somehow these visions of a bright wreath for spring ended up in this. 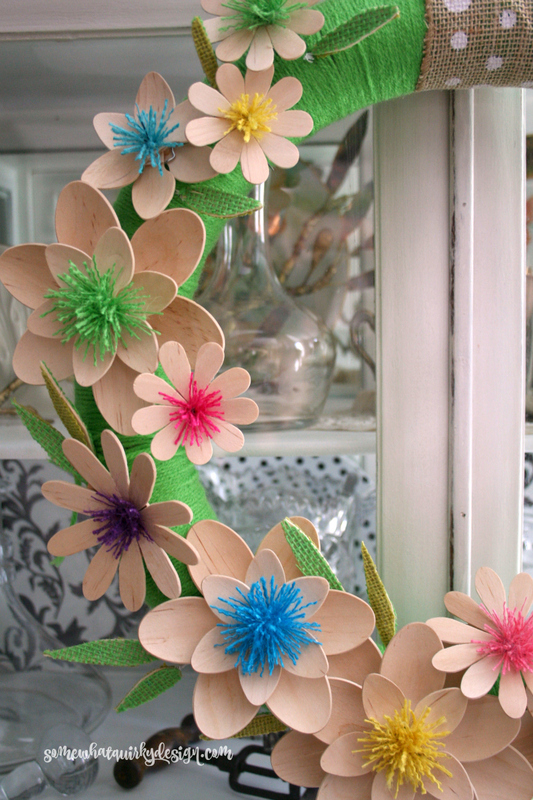 It's bright and springy and I didn't have to cut out or fold one paper flower. You like it, don't you? You want to make one, don't you? So I'm going to show you how. 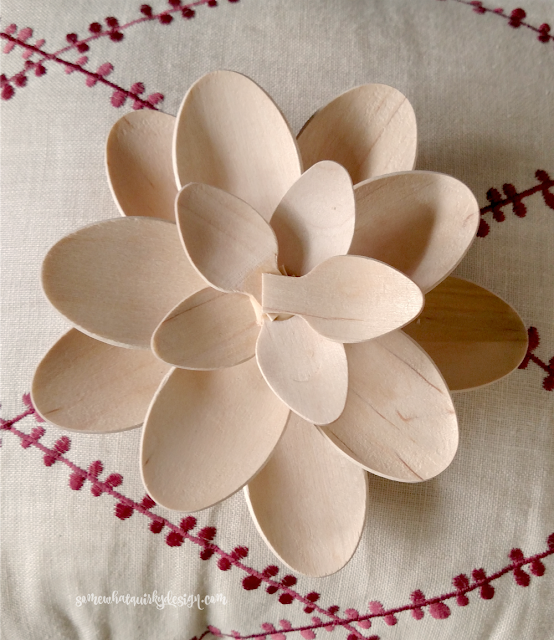 Wood glue and/or craft glue - I used wood glue for the spoon flowers and craft glue for the flower centers. Floral wire a variety of gauges would work, but it needs to be strong enough to poke through the wood. I also used fabric covered wire. Wire cutters - any kind will do. Needle nosed pliers - these often have wire cutters at the base of the pliers. Glue together sets of spoons. I used wood glue here instead of hot glue because I wanted this to be front door eligible. Hot glue melts outdoors - even winter sunlight can melt hot glue. If you glue your pieces in an assembly line like this, the wood glue will be dry by the time you put your flower together. Glue together 3 sets of spoons. Space evenly. Glue one small flower to the center of the larger flower. NOTE: Making six petal flower is the easiest way. I experimented with 5 petal flowers which you make by gluing 5 single petals together. Press together for a minute or so then set aside to dry. 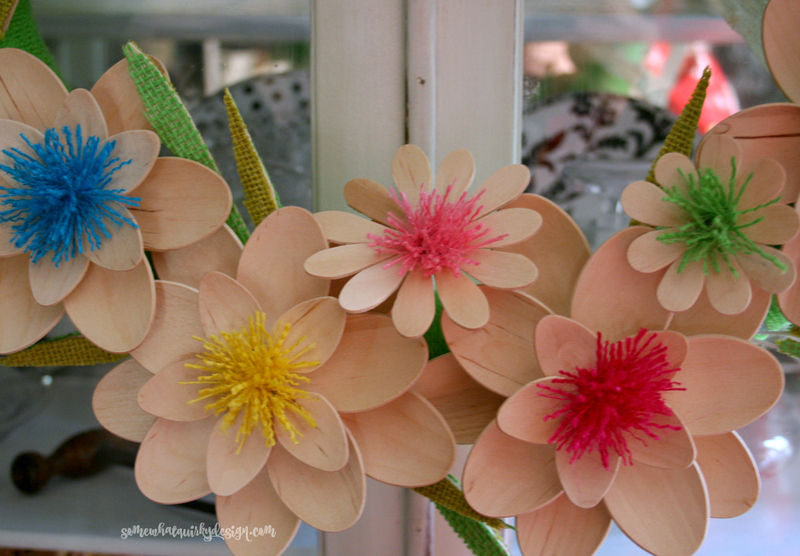 I used the 5 petal flowers in both sizes to double up and make the biggest flowers. Go a little rogue. I had a million handles that I could not stand to let go to waste. I cut them into petals and then glued them over the extra spoon pieces to make little daisy-like flowers. I love these flowers. 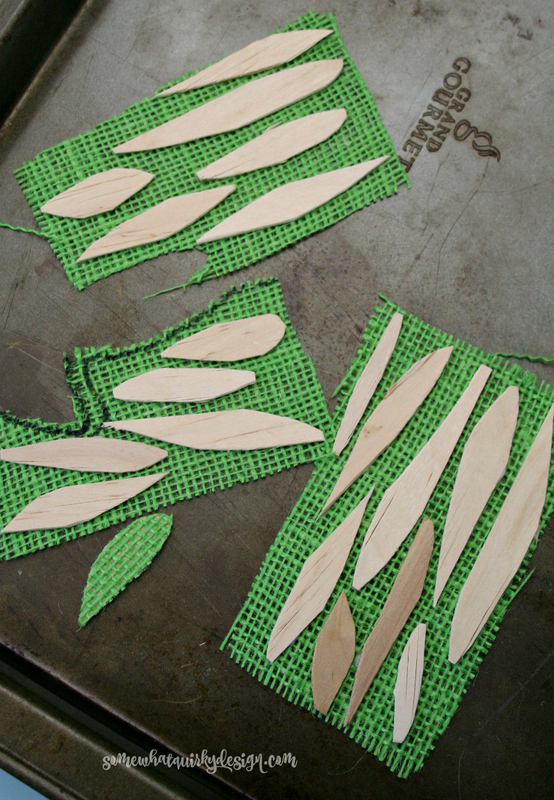 Cut some of the stems into leaf-ish shapes. I thought leaves would be sort of cute. They are totally optional. When your tiny spoon stem flowers are completely dry, work a piece of the florist wire through the center and press in a tiny fold at the tip with the needle nosed pliers. 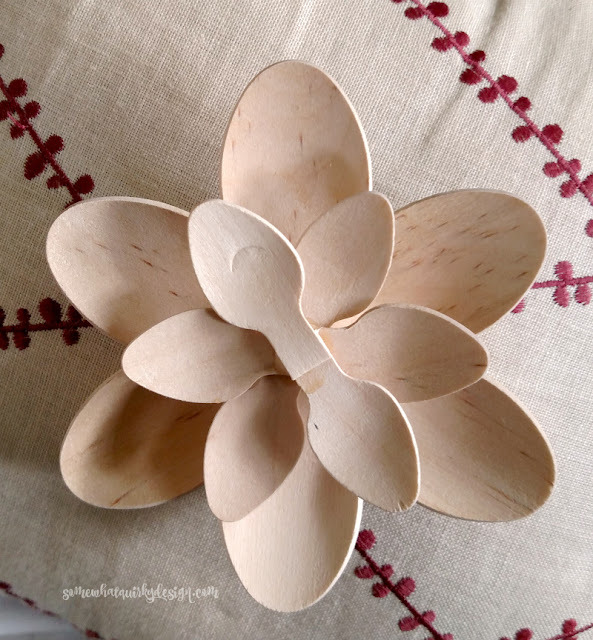 Put a blob of glue in the center of the flower. Aleene's craft glue is great for this because it is very thick. Stick one end of the jute pieces into the glue until the area looks full and fluffy. If necessary, add another blob of glue and fill with jute. Do this until the middle looks like you want it to (I did it until the middle area was evenly covered. This is not hard but takes a minute. I recommend binge TV for this. 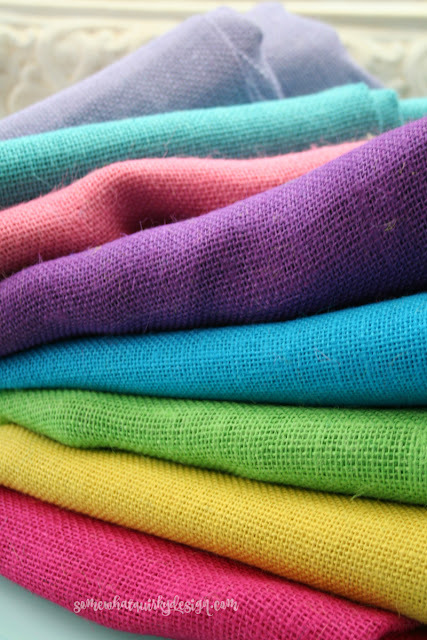 Lay out one color of green burlap. Cover one side of leaf with craft glue. Press leaf firmly onto burlap. When all the leaves are on the burlap, pull up and move to another spot so the burlap doesn't dry to the table. Cut apart (when completely dry). Cut closely to the edge of the wood. Cut a small V into the wood - about half-way up the leaf piece. This is making a slight indention for your fabric florist wire to sit in. I used the floral covered wire for this because I thought it would glue better than the naked wire. 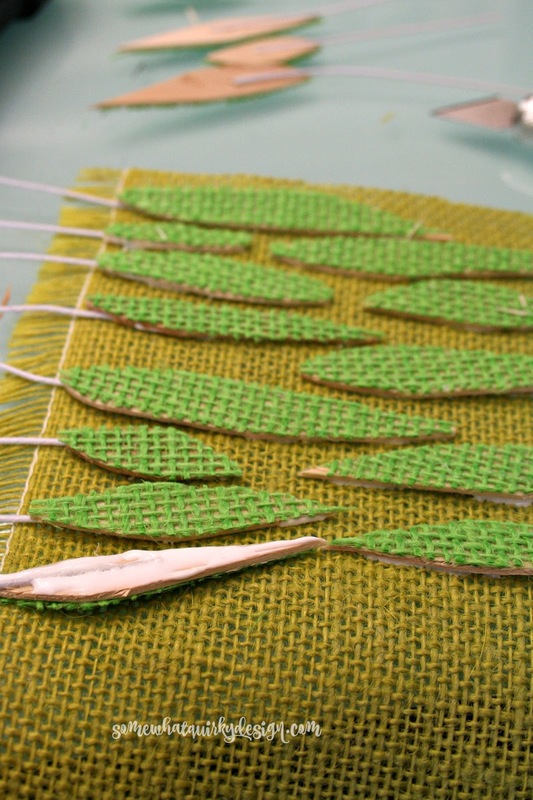 Spread glue over the second side of the leaf and lay the fabric covered florist wire into the indention you just cut. Turn the leaf over and press it firmly against the second color of burlap. (I happened to have two colors, but that also is optional). When completely dry trim the leaves as you did for the first side. Let everything completely dry overnight. Wrap the yarn around the wreath form until it is completely covered. Pin or tie the loose ends together. Gather up a bunch of greening pins. 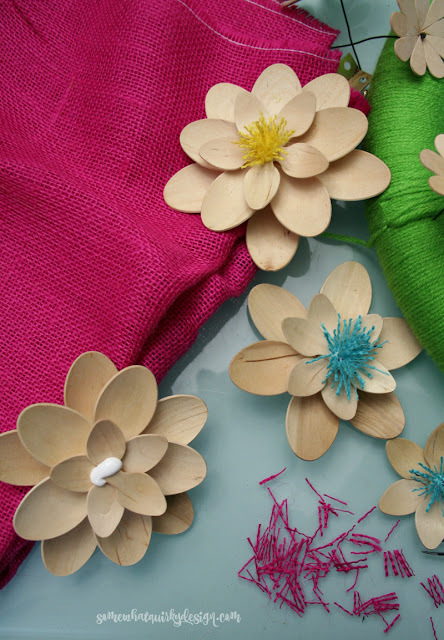 These are what you will use to add the spoon flowers. Just slip the pin around the neck of the spoon. Stick the pin into the wreath form. 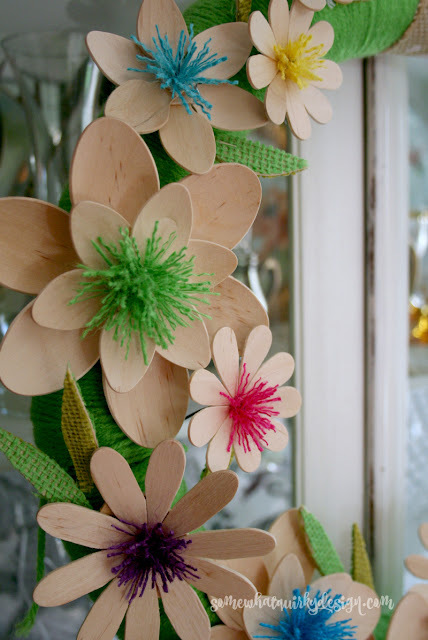 Add another pin on the other side of the flower to keep the flower from wobbling. Add the little flowers that you made from the spoon handles Remember when you added the florist wire to the center? Just stick that wire into the form wherever you want to flower to go. Keep moving the flowers around until you have them where you want them. Add the leaves. I found that the fabric covered wire didn't move into the foam so easily. 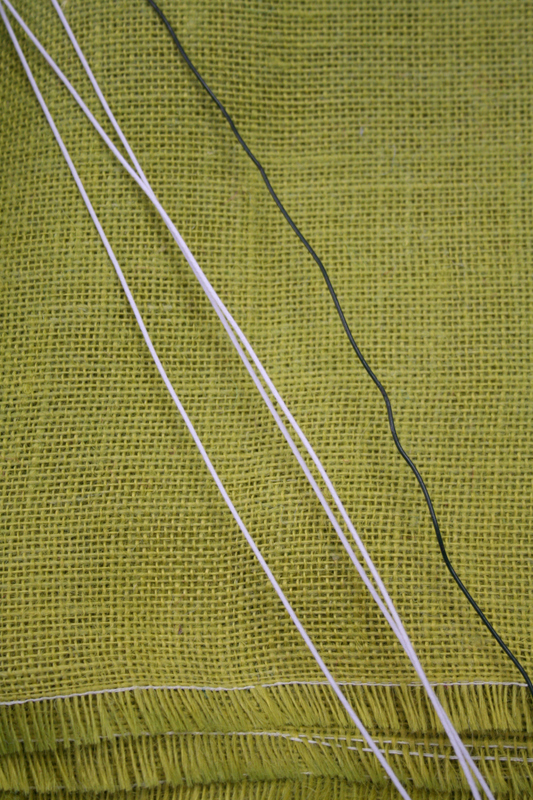 The fabric actually twists off (it's just wrapped around the wire). 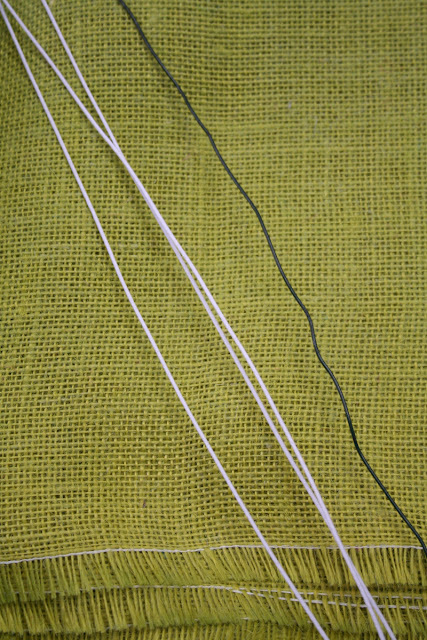 Remove the fabric about halfway up the wire and stick into the form. You can bend the wire to make the leaf go wherever you want and whatever angle you want. If you have two colors on the leaves, vary the color that is showing. Tie matching yarn around and make a loop for hanging. Stick in one of the greening pins to make a hanger. I'm sure this wreath would have been even lovelier hanging against a plain white surface but alas you will have to imagine it that way. Sorry. But it IS lovely . . . right? I'm never quite sure that the next step is the best step. And I don't enjoy backtracking. I might make more of these to sell, but make them a little more minimal, like the inspiration wreath. 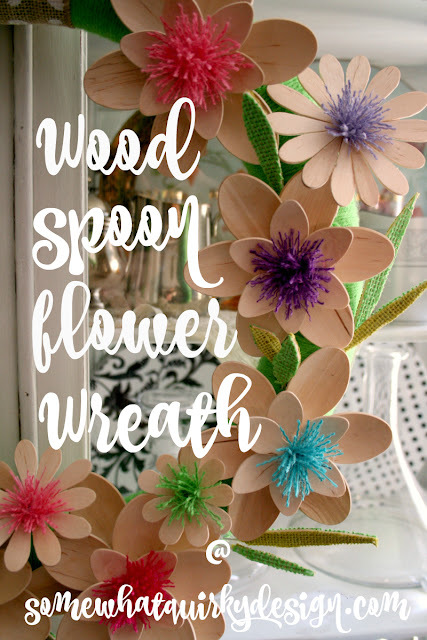 I've also thought about painting the spoon flowers to make a really colorful wreath to look even more like the multi-colored inspiration in my head. I'm curious what you think about spoon flowers. Or too crafty looking for you? I go back and forth. Even though I really, really like her. 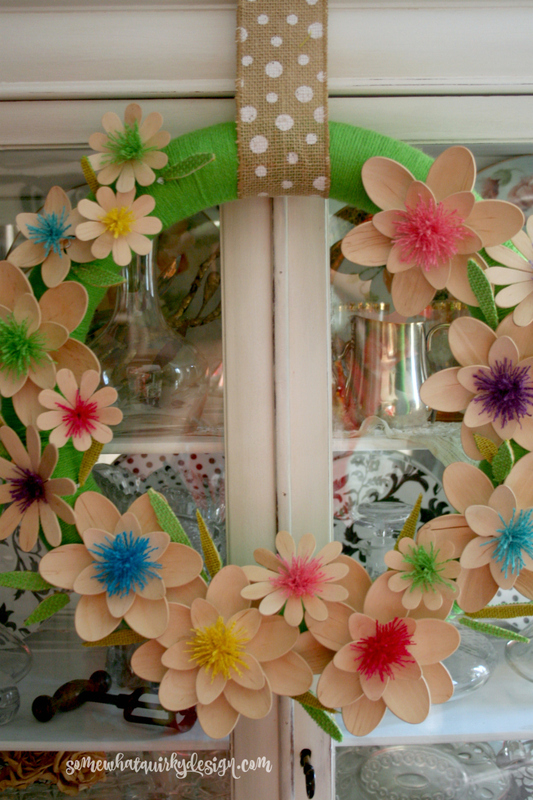 Gosh, that is one of the cutest wreaths I have seen lately! I realize you are trying to use up materials you already have, but wouldn't doing little pom-poms be easier and faster for the centers? Can you tell I have no patience for time consuming things! Have a great week, Karen. 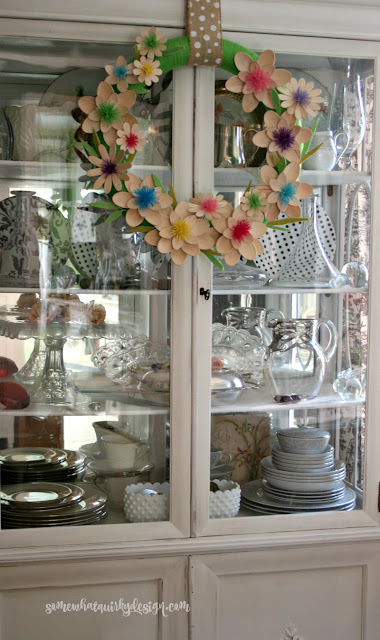 ONLY because you asked...... it's cute and colorful but too craftsy for my taste. But you gave a very good step by step tutorial for those who would like to make one! I love it, I pinned it. This is SO COOL! What a great idea! I hope that your hip is healing and that soon you will be posting ways to get rid of menopausal fat. Or refinishing chairs. Whichever. Well, that is just the cutest wreath around. That sis quite a project, but so cute. I admire your fun attitude and craft skills. We so appreciate you sharing your creativity at DI&DI.